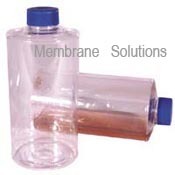 MS® roller bottles are made from polystyrene (PS) and feature one-piece seamless construction .The caps are made from high-density polyethylene (HDPE) and are free of heavy metals . Both plastics meet the USP Class VI requirements for plastic containers and closures. MS® roller bottles are optimal for large yield of cell growth and multiplication, that can be used in both research and manufacturing , including the growing of mammalian cells for purposes of virus vaccines and recombinant proteins used for therapeutic approaches and other biological products which made with cell products .